This past weekend, Shabang came back, bigger than ever before. The bi-annual San Luis Obispo music festival held its 10th event at Laguna Lake Park. The event featured local music and art collectives to embrace a shared passion for music, art, nature and community. Shabang was founded Spring 2014, when friends Carson Stone and Greg Golf decided to host a concert at the top of Cuesta Ridge during their sophomore year of college. Their goal was to throw an event where they could enjoy music outdoors. What was once a concert quickly turned into a small festival held twice a year. By Shabang IV in 2015, nearly 300 attendees made their way up to Cuesta Ridge to share their love for music. According to Shabang’s Public Relations and Media Outreach Coordinator Myles Franklin, though the event was informal, people rapidly caught on to what was happening on top of the mountain. After Shabang V, the Parks and Recreation Department of San Luis Obispo gave the founders federal misdemeanors for holding the festival at Cuesta Ridge. According to Shabang Outreach Director Ryan Snow, the founders wanted to come up with a new, secluded location, so Shabang could live on. Shabang VI was held at Laguna Lake Park, and the event has been held there ever since. “We kind of stuck to our roots by basically going back into the trees, but still having our own little area,” Snow said. Shabang continued to get bigger and bigger. By Shabang IX, nearly 2,700 people attended, according to Snow. Four years after its creation, Shabang has expanded to one of the most highly anticipated events for music lovers of San Luis Obispo. Shabang X welcomed nearly 4,000 people who came together to celebrate music, art and each other. The event offered live music, local artists, vendors and Cal Poly clubs, including the slack line club and the hammock club. Although many of the traditional amenities Shabang has provided throughout the years carried over, this latest festival gave attendees a whole new experience. Unlike prior festivals, Shabang X decided to take it to the next level by partnering with local music and art collectives Respect the Funk and SubSessions. Shabang X was the first to have this collaborative musical experience. Respect the Funk hosted their NVRLND: A Silent Disco Experience on the Janky Barge, a large “art car” they brought all the way down from Burning Man festival. Snow said the Shabang coordinators’ goal was to create a more enjoyable and engaging environment. The NVRLND stage had two DJ decks and a large immersive art experience. Attendees were given headphones to enjoy music from local DJs from KCPR’s Club 91 and SubSessions. SubSessions is a student-run music and arts events planner platform that recently emerged in San Luis Obispo. 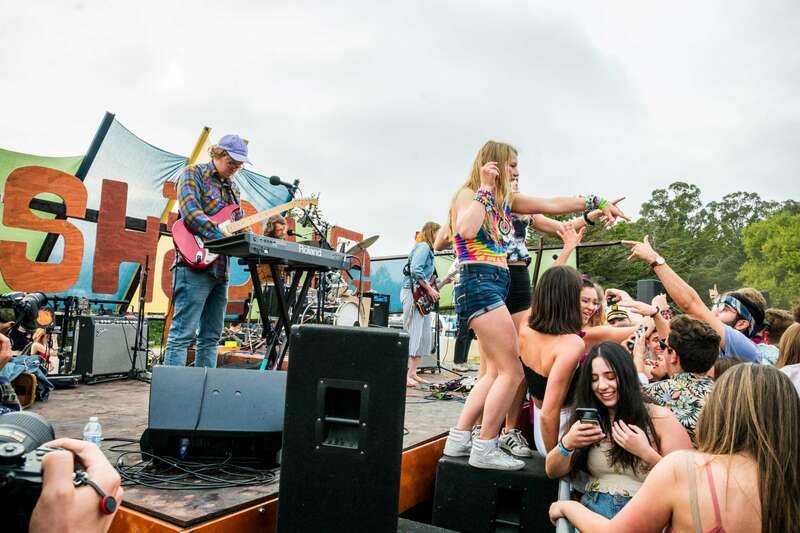 According to SubSessions’ production and project manager and business administration junior Kelly Ridder, this platform evolved after he and his friends noticed a gap in the San Luis Obispo electronic music scene. With that in mind, Ridder and the other SubSessions members decided Shabang X would be a perfect opportunity to simultaneously contribute to the growth of Shabang as well as the electronic music scene. Shabang X proved that the festival has the ability to reach new heights in years to come. Though nothing has been set in stone, Shabang would like to move into new locations as it continues to expand. Although what Shabang has in store in the future is still uncertain, the festival continues to stay true to their mission: to support, embrace and uplift local art and local music. Franklin said though Shabang will continue to embrace its local and community roots, the festival strives to continue to grow into something much bigger.